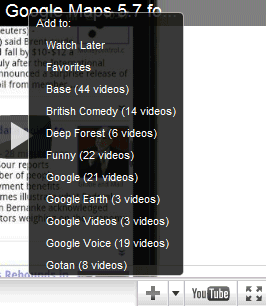 YouTube's embeddable player added a new feature that lets you quickly update your playlists with new videos. Click the arrow next to the "plus" button and you can add the video to one of your playlists. You can't create new playlists from the player and you can only see the first 10-15 playlists, depending on the player's height. I couldn't find a way to scroll the list. It's surprising that the embeddable player doesn't have like/dislike buttons and you have to go to YouTube's video page for such a simple action. There's also a contextual menu that lets you copy the video's URL and the embedding code, but YouTube uses the old Flash-only code. yeah. dislike that i cannot quickly like the video while it is playing. "Here's a video you're probably anxious to add to your playlists"
It doesn't work well if you have more than 10 playlists... the list doesn't scroll down. I would go with the previous comment. It gives error when the playlist number increases. thank you, very much, your blog are a big blog. It uses a third party service http://youtubeplaylist.net, I find it really helps me out of managing playlists."